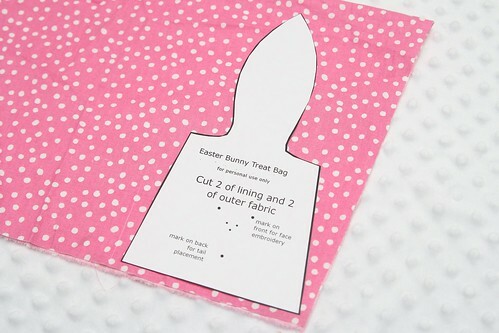 I wanted to make something fun for my kids Easter baskets this year, something they could use again and again every year. 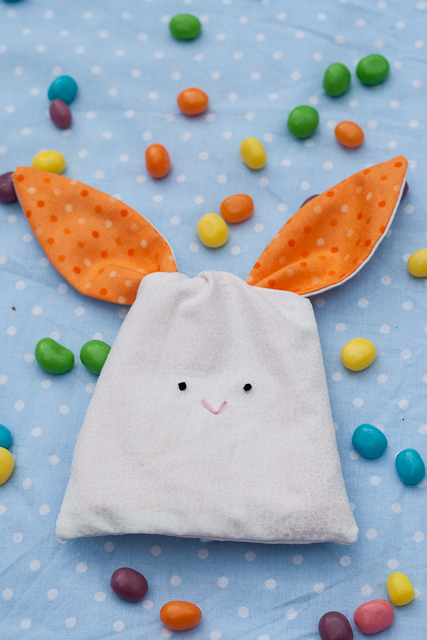 When I was little we always had the traditional treat filled plastic eggs, but we also had a few different small treat containers that got pulled out every year. The ones that stick out in my mind the most were these little bunnies and ducks that my grandmother crocheted. They actually had a small hole in the back where you filled them with candy so it looked like they pooped jelly beans, which I thought was hilarious when I was a kid. 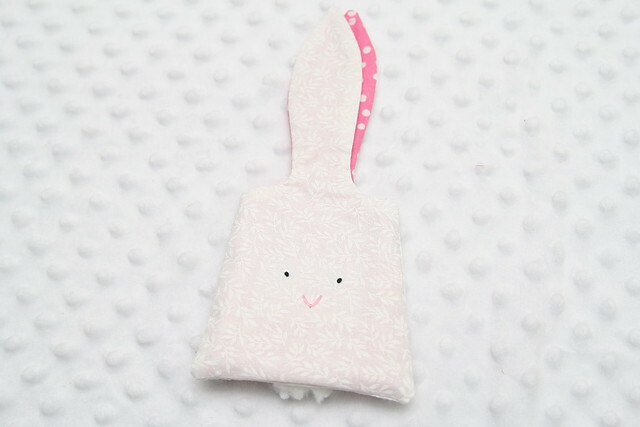 I am sure Andrew would love a pooping bunny too, but unfortunately my crochet skills are a bit rusty so I couldn't make him one, instead I came up with these little bunnies. 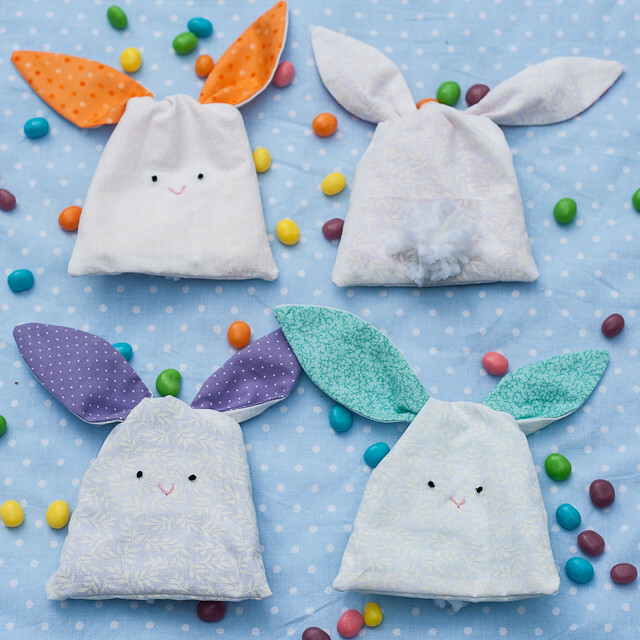 Just fill 'em up with your favorite Easter treat and tie their little ears in a knot. 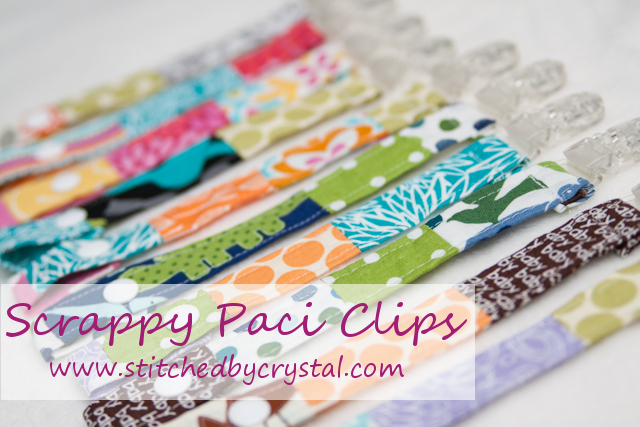 They are small so they are a great way to use up some scrap fabric you may have laying around. 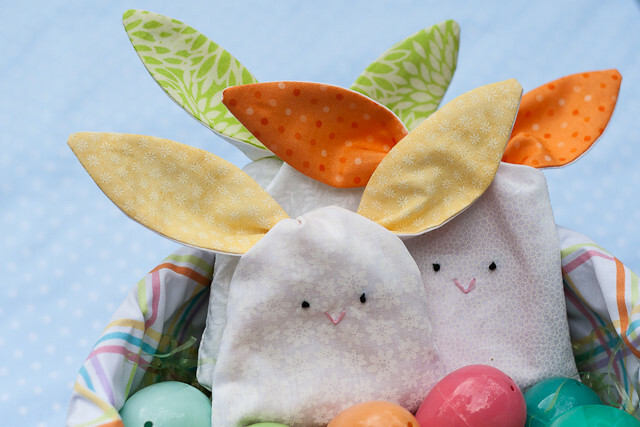 These little guys are quick to make so you probably won't be able to stop at just one. I made six, three for each kid. 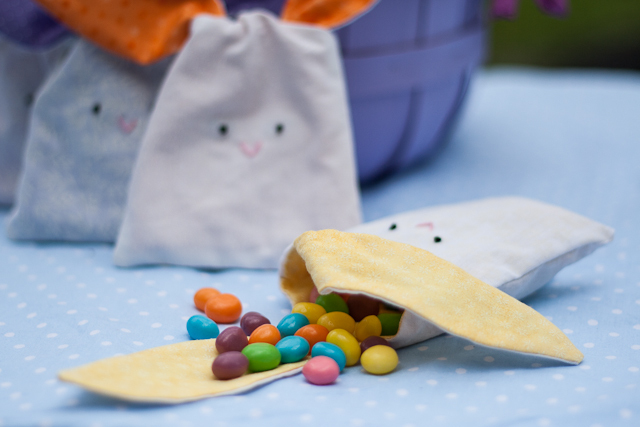 Then on Easter they can be tucked in their Easter basket, or hidden with the eggs. 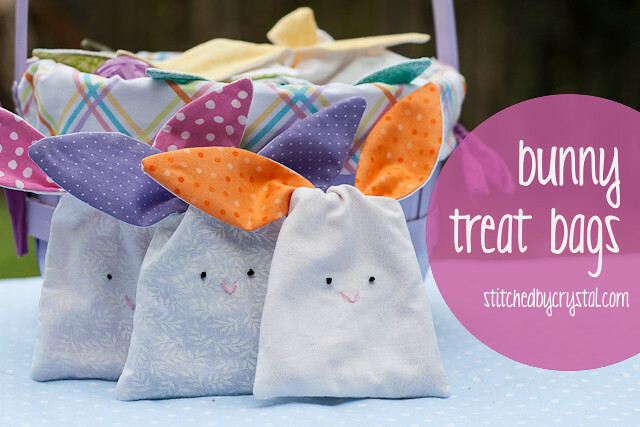 Want to make some bunny treat bags? First download the pattern HERE. 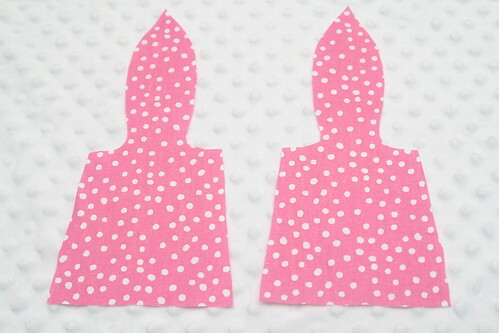 Cut out the pattern piece and use it to cut out 2 white pieces and 2 color pieces. 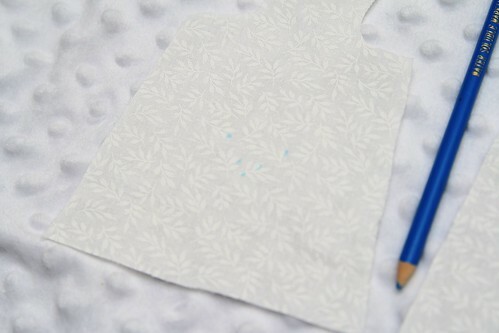 Using a water soluble pencil, transfer the dots for embroidering the face on one white piece and for adding a tail on the other white piece. 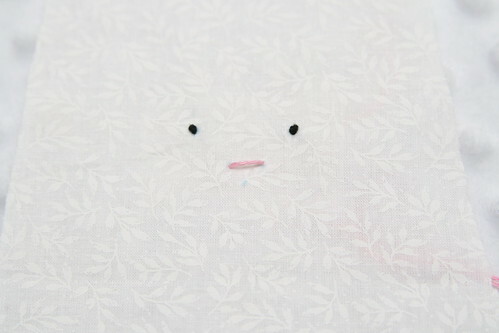 Use embroidery thread to make the face. 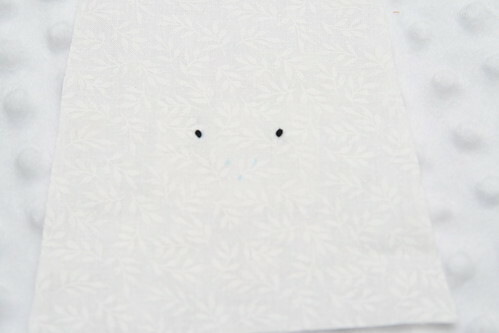 To make the eyes, push your needle up from the back of the fabric where you drew the dot for the eye. 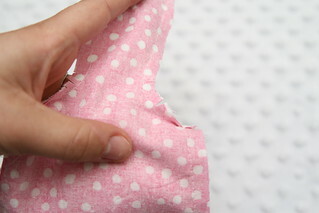 Tie a knot in the thread an push your needle back trough the fabric on the dot. Tie both ends of string off at the back. 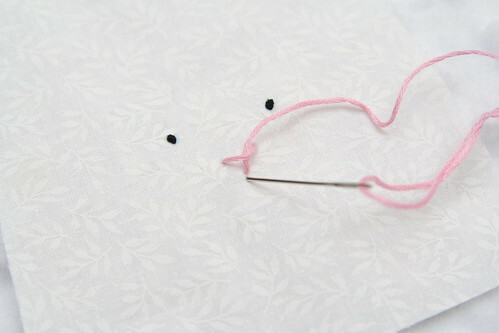 To make the nose, make a stitch between the top 2 dots. 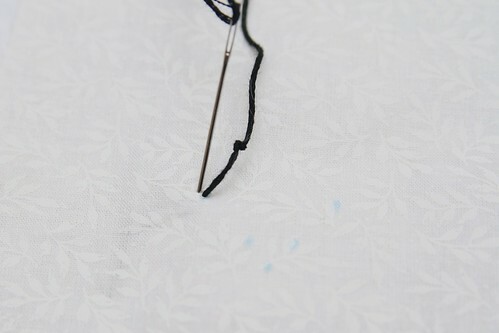 Bring your needle up through the fabric at the third dot and under the stitch you med. 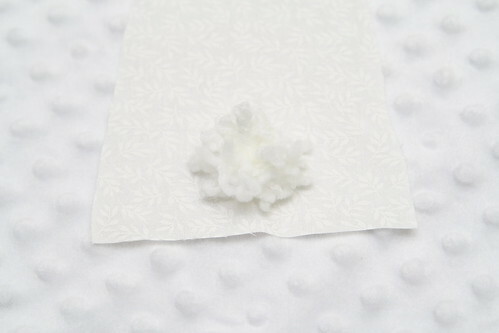 Then push the needle back down through the fabric at the bottom and tie off at the back. 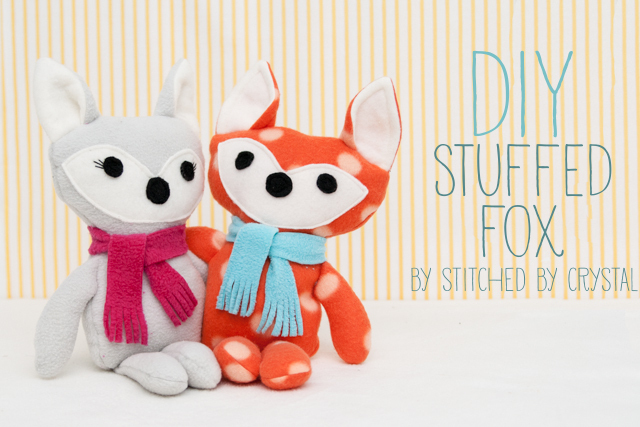 Add a cotton tail on the back using a store bought pom pom or make your own with some yarn. 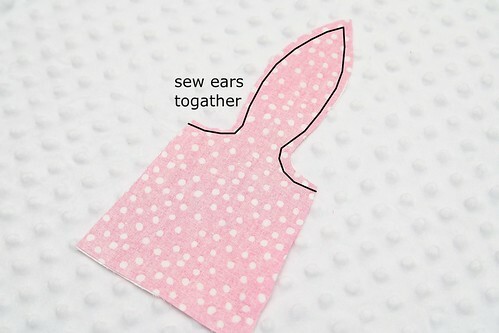 Next put one white piece and one color piece right sides together and sew along the ear. Repeat with the other pieces. 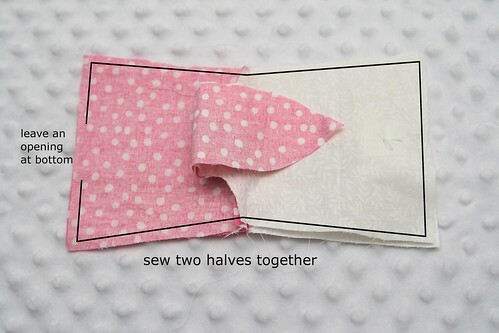 Open the bottoms of each side and place the two sides together, lining up the white and color sides. Sew around the edge leaving an opening in the bottom. 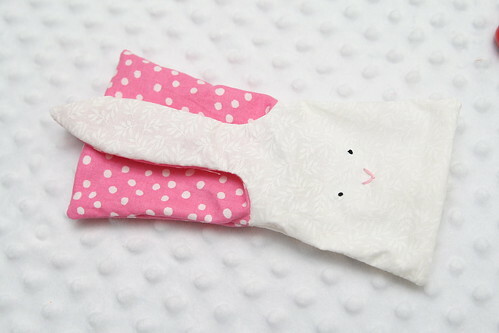 Be careful not to catch his little cotton tail or one of his ears in the seam! 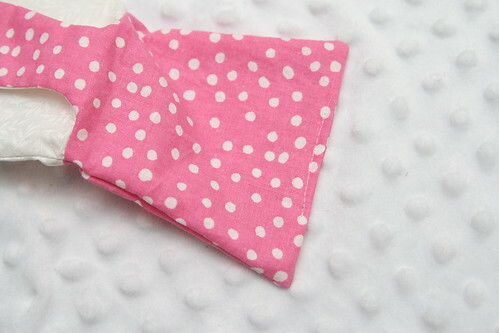 Clip the tip of the ears and along the seam allowance in the curve. 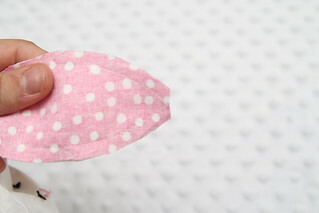 Turn the bunny right side out through the hole in the bottom and then sew the hole shut. Tuck the lining down inside. 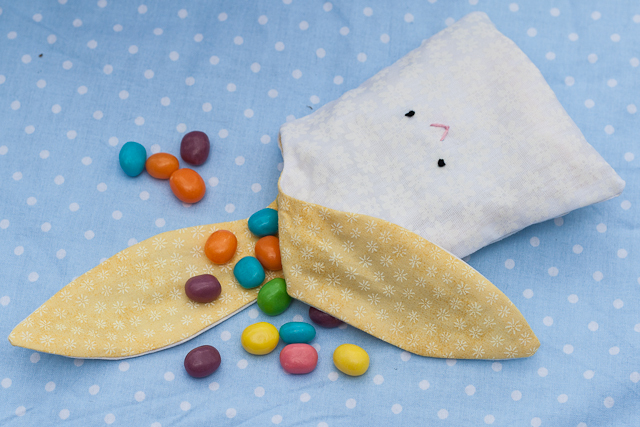 Fill him up and he is ready for Easter! Those are so adorable! You amaze me. 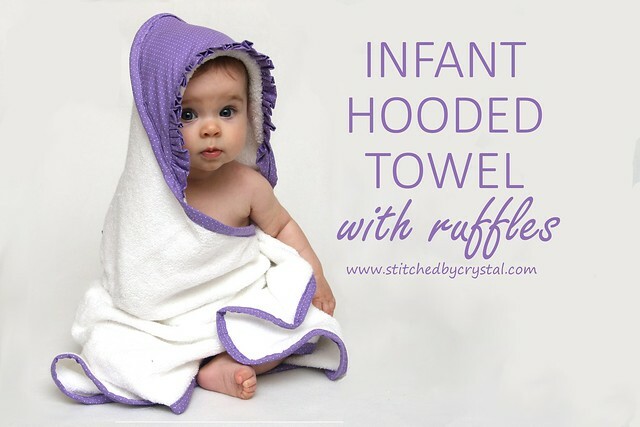 Can't wait to make these for my granddaughters. Thanks. Thanks! I went back and forth on whether I should change the name, I am glad I did! Such adorable bags. You sure are doing an amazing job. LOVE these!! 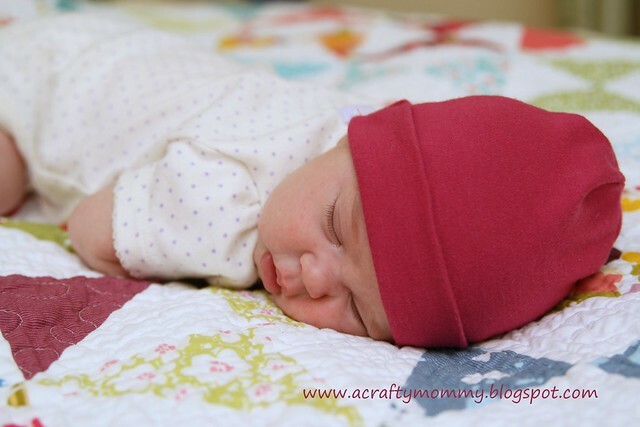 Now to find some time in front of the sewing machine! Thank you! 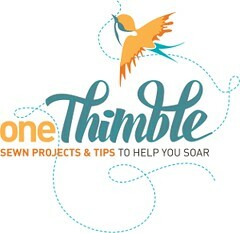 I love this project!!! 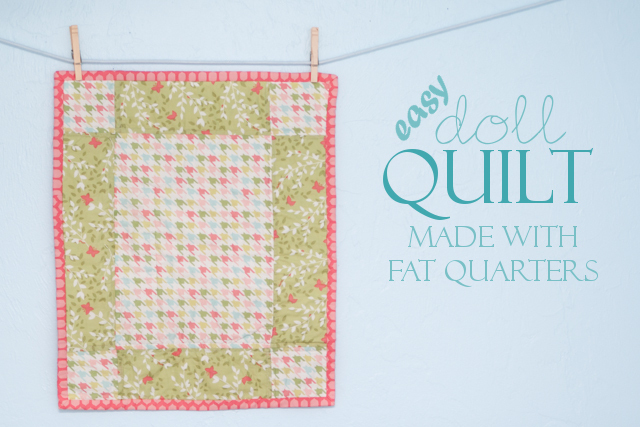 Now I have an excuse to sit in front of my sewing machine! Yay!! 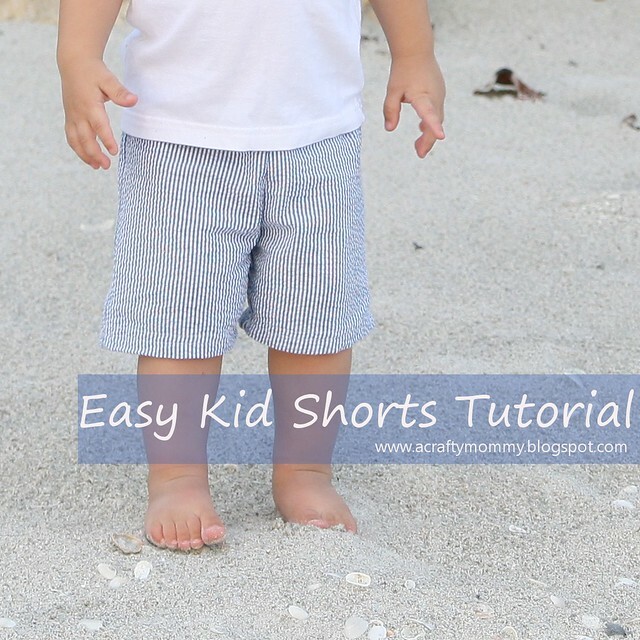 Would it be all right if I used this pattern for my kids sewing class? I would give you credit for the pattern. 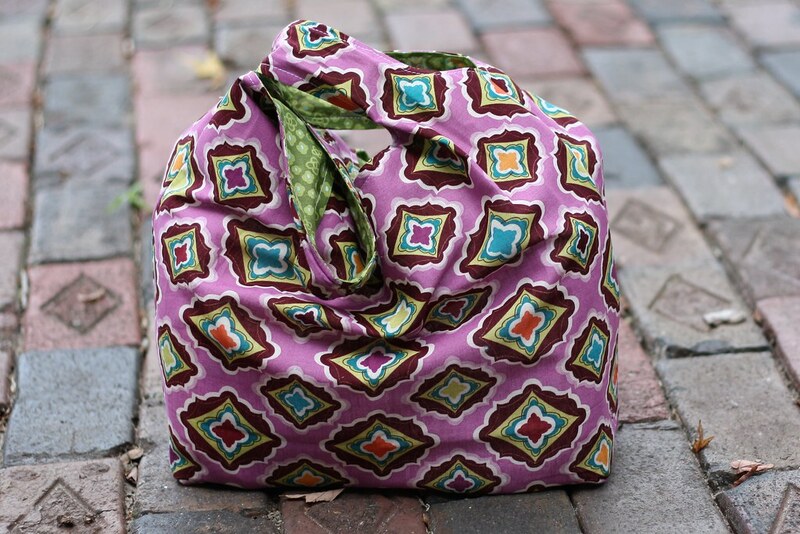 Where do I find the pattern piece to print out? That is my question also. Did you all find the pattern? I Love these! I do wish that your tutorials were printable. 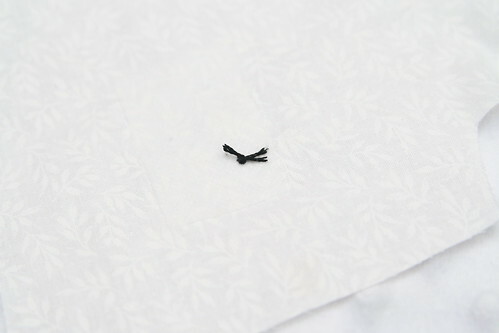 I need to print them to use them next to my sewing machine. Guess I need to copy and past, sigh. 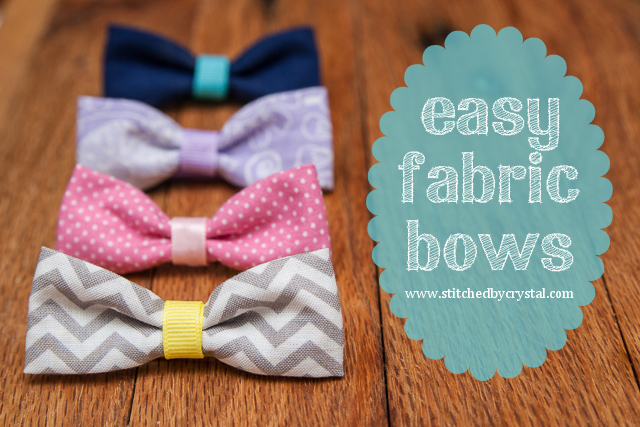 Makin' them this week! Thank you! Thank you! I love them! 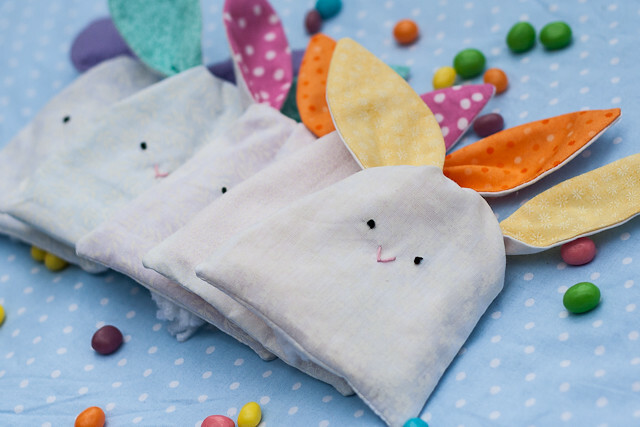 Making them to easter. Die Stoffhasen sind total süß! looking so nice. I like it. Thanks for sharing. 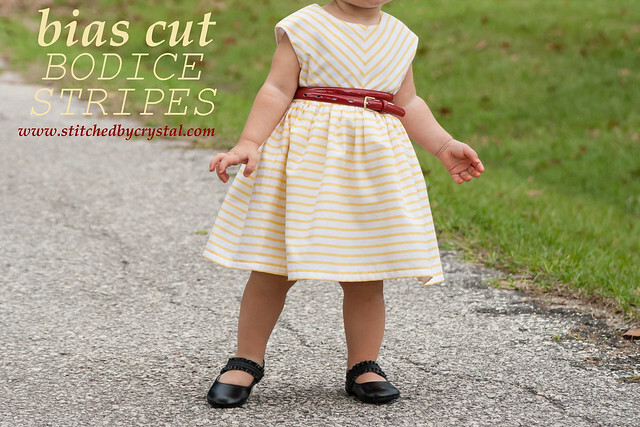 You have some super super cute and easy to sew ideas. Love them! How cute they are. I believe every little one will like it. Thank You for sharing. You made me look so good at Easter! Merci pour ce joli tuto ! Bon week-end ! I was looking for a simple but cute gift for children. Thank you for sharing! These are cute! Definitely going to make some for next year! Any thoughts on modifying them into reindeer? Adorable! Thank you for the tutorial!